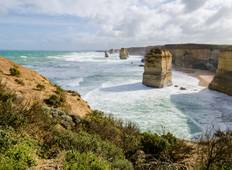 Find the right tour for you through Apollo Bay. We've got 13 tours going to Apollo Bay, starting from just 3 days in length, and the longest tour is 17 days. The most popular month to go is September, which has the most number of tour departures. "Kelly was great. Very amiable and helpful. Lots of stories and info. On time and..."
"I thoroughly enjoyed the tour. The small numbers meant we got to know each other...."